Powerful advanced features allow you to extend the basic, easy-to-use features of FIREHOUSE Software and customize the program to meet your department’s unique needs. Know at a glance the changes that have been made to your databases. Using the Database Audit Log you can track what changes have been made, when the changes were made, which user made the changes, and which workstation the changes were made from. Transfer information from other programs into FIREHOUSE Software quickly. All you need are records stored in standard formats like DBF or ASCII. Using the external data import designer within FIREHOUSE, you specify how the external data is brought into the system and where the fields in the data go, then run the import. Browse the results, and if they look good, commit the data to your system and they are available for browsing and reports. Design validation rules for saving records throughout the FH system, or specify default values to add to any field in the system when you create new records. The validation rules you specify are flexible. Every field for data entry forms can be required at all times, or required based on values from other fields in the record. When you add conditions that must be met for a field value to be acceptable, you also control the error message displayed to help the person entering the record correct the value. Default values can be added for fields in data entry forms in all areas. The specified default values are automatically added when new records are added. Create a standard record that can be recalled to speed data entry. Templates are available in all modules, so records that share a lot of common information can be saved. When a new record is created, the template can be recalled, automatically completing the common information. Add new fields for tracking your department’s data. Define the type of data for your user-defined field, and select what type of control to include on the form for entering the data. User fields take advantage of system rules and default values, so you can control when user fields are required. Use lookups for your user fields when you want to specify allowable values. Design queries that will gather data for report forms, and display available records which can be output to a file or copied to the clipboard. Using the Query Designer, you can select data tables and fields to include in query results. You can join related tables using Inner, Left, Right, and Outer SQL joins. You can also add criteria to exclude specific records from the query results or allow users to add criteria at the time they run the query. Using Report Designer, you can edit existing reports or create new reports to present data analysis on printed forms and in electronic PDF files. Report Designer allows you to carefully control how the printed report form looks. Advanced functions in Report Designer provide opportunities for special calculations and analysis within the form layout. Within FIREHOUSE Software, you can create graphs that illustrate your FH data. Use existing preset graphs, modify the graphs to suit your department’s unique needs, or create your own graphs from scratch. You can use report queries as the basis of graphs. Available graph types include: Bar, Line, Area, Pie, Point, Curved Line, and Stacked. Graphs can be saved as bitmap images to import into most word processing or spreadsheet applications. Internal Messaging allows you to send messages within FH to specific staff. You can create multiple notes on save so they can be deleted individually. 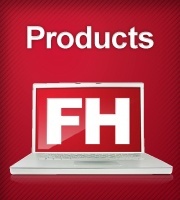 FH internal messages can be sent to all FH users, specific staff members by name/station assignment/rank/status (if a Staff ID is associated with an FH user login record), or specific users or user groups if you do not associate Staff ID with FH login records. Internal Messaging checks for unread messages at a user-defined interval and automatically displays a message when a message for the currently logged in user is received.